Yesterday gave us nothing in the way of meaningful price data. In a range-bound market, a day that stays well within that range doesn't help much. So the crash count is still out there -- but the market has really moved no closer to it and no farther from it, as not one key level was violated in either direction (this applies even to short-term levels not outlined). Materially, there is simply not much to add to yesterday's counts. The short term structure is still an ugly mess, and leaves a lot to interpretation. The biggest challenge is that the structure is vague enough that it's very difficult to zero-in on minute knockout levels. The key levels to validate the bear case are still 1215 and 1190, the key level for the short-term bull case is still 1292. There has been nothing to change my opinion that we are forming a significant top. My preferred view is that the top was made on October 27. By now, all my readers know I have been strongly favoring a bearish resolution. During Monday's session, crude oil added further weight to the bearish view. On Friday, I presented some charts and a real-time update on the oil market, and opined that crude would put in a top either that same day, or on Monday. So far, it appears I may have nailed it... we'll see if the market continues to play along. Crude traded down throughout virtually all of Monday's session, and seems to have traced out a first wave lower. Crude and equities have traded in pretty good lockstep for some time, so crude may well be leading the way lower for equities here. At major turns, there are endless potentials. As I just mentioned, I am still favoring the bearish resolution by a large margin, as I have for several weeks. But I must stress there has been no objective confirmation yet, since 1215 and 1190 still haven't been broken. Sometimes novice traders get annoyed with this type of market and demand that someone tell them whether they should be long or short. There is a problem with this type of thinking, and it's one of the reasons 95% of traders go bust: long or short are never the only two options. Cash is a position, too, and if you, personally, are unable to trade a manic market like this, then it's usually the best position. In range-bound markets, there is an interesting dynamic that comes into play with traders, and it can be described with something called Prospect Theory. Prospect Theory has shown that people become risk-averse when facing a gain, but they become risk-seeking when facing a loss. This is why many traders tend to hang on to their losers longer than they hang on to their winners. A losing trade actually makes people take more risks than they should, and this mentality seems built-in to our psyches. Conversely, when people gain a small profit, they become anxious to protect it. As a result of this psychology, people tend to trade in exactly the opposite fashion of the manner that's profitable. The profitable manner is: cut your losses and let your winners run. Let's use the example of a bull who buys some stocks at SPX 1280, and the market heads down immediately after his purchase. He is facing a loss, so according to Prospect Theory, he becomes risk-seeking, and hangs onto the trade "hoping" to get even. Though his account is at a loss, eventually the market rallies -- and now he's getting close to even... but then suddenly the market sells off again. Next time it rallies again, he will now be willing to sell for a loss, and a bigger loss than he would have accepted on the first run up. The same happens in reverse for the bears. I think this psychology is a contributing factor to contracting triangle patterns... each time the market runs up, the bulls who rode the elevator down are willing to sell for less just to get out, and each time it runs back down, the bears who rode it up are willing to pay higher prices to cover their shorts. So the price points gradually converge: highs get lower, lows get higher, because both sides are feeling beat up. Eventually, when enough traders have cleared out from one side of the trade, either buyers or sellers, the market finally breaks out of the pattern. Who wins will come down to which side has more conviction. Alright, on to the muddled charts. I'm not going to present all the charts I presented yesterday, so if you didn't read yesterday's update, you could do so to familiarize yourself with the potentials. The SPX chart is still not terribly helpful over the very short term, I'm afraid; short and intermediate term potentials are too plentiful right now. My projected resolution to the pattern is for the market to turn south without breaking 1292. If this is occurring, it usually plays out as a false breakdown from the triangle, in wave e (see chart), then whipsaws back up into the triangle and takes off upward in wave C. It's generally a strong rally out of the whipsaw, much like we saw on October 4. Be cautious of this, because you can see it when it happens, and there is no reason to get caught on the wrong side of a move like that (below). Beyond that, not much to add to yesterday's picture. The market continues to run back and forth in the range, and won't provide much in the way of additional clues it breaks one way or the other. Trade safe! haha it was a good post. I just like clicking the i like pizza button. Today seems like a sideways day again. I have to agree with Mav, when the market is moving sideways, I just get hungry. Completion of an e wave in futures market only? ...that would surprise me, I think we'll go down in the AM shortly, then we'll see what happens. I don't much like the structure of yesterday's move down if it doesn't accellerate lower soon. I would tend to favor the black "alt: (c)" in that case. Apple might want to check out 388 +/- again. I had to travel to Zambia and the connectivity is not that great here in Lusaka. Today the JSE raced up the whole day, irrespective of any other market action anywhere in the world. Probably because I'm not down there in the trenches keeping Bully down! Or perhaps this bearish avatar is just a bad omen... if S&P breaks 1292 I'll have to don my Ghanian Party hat again..
Yep, all your fault Jaco. You were called into duty yesterday, but you were too busy traveling the hell around someplace I couldn't locate with a GPS! Bully don't travel around Lusaka, soldier! AAPL to test 384 and then 388 right Pretzel? I think it is going to be hard for Jako to join us for a beer. Anybody on this board shorting oil? According to pretzel's chart, this would be an ideal shorting opportunity with a tight stop. Any thoughts. That would be my guess, Frank. Dollar forming a very interesting pattern now. 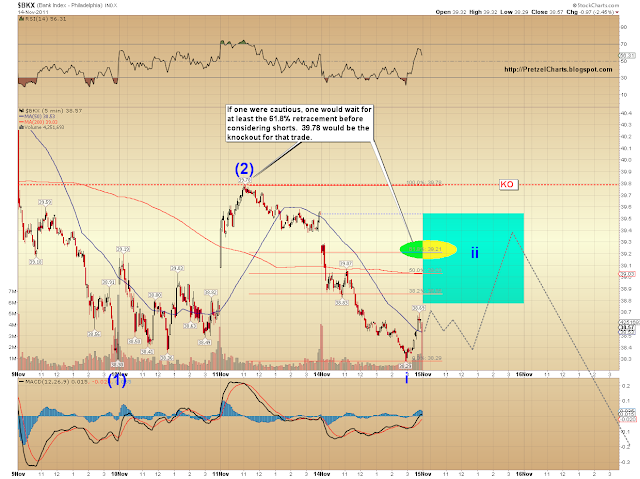 Looks like it might be forming a nested 1-2 series, which could be VERY bullish after a brief correction. My thoughts are that, hypothetically of course, since I don't do trading advice... that would be a GREAT move. Pretty clear risk/reward levels. Theoretically. I bought into sco Friday at $40. Will put in a stop at $39 I think. Thought it was about to roll over, but is holding up today. Any thoughts Pretzel? Could we take out the $99.40 high from Friday, or do you think we're jyust starting a correction/downturn? Sorry - for clarification I was responding to Millertime and the $40 price is for the SCO short oil etf and the $99.40 was in reference to WTI crude prices. But of course, NONE OF THAT IS TRADING ADVICE. Anon, got it. Did I answer your question? Right - not soliciting trading advice - just wondering what your levels are for my own academic gratification. pretzel, a little confused, are you saying you don't like the structure this morning so far? Rock, honestly, the SPX is a pile of crap right now. The structure is almost "uncountable" and could morph into just about anything. I'd really like to see it accellerate down, if this is a third wave. - Positive US data (better than forecasts), eg. Empire State Manufacturing @ +0.6 vs. -2 forecast. that new bkx 60%probability chart for tues-wed is tough for spx, or any other market, to go against, so it kills the bear case for at least 2 more days. you got a 40% chart to go with it on your alternate count, that's bearish and not bullish, for next 2 days? As the bkx leads today's bearmarket, as I am sure you know. spx or commodities will do nothing down, until bkx turns down again. btw, as off this moment, c, db, jpm, ms, wfc, gs, are down today, and only bac is bucking the trend. so maybe that 40%prob bkx bearish chart, may turn out to be min. 50%prob. Rolf, your comment went to the spam box for some reason. Ty for those updates, btw. Rock, I'm starting to like what I see in the dollar though, so that may hold better answers. Might correct a bit here first, but if it breaks 78.5, it could be off to the races in a big way. I get the feeling this market is about to do something dramatic in the next couple of days, coiling snake around the spring summer head and shoulders neckline around 1258...making me a bit nervous. I ran out of time last night. My alternate count for the BKX is that yesterday's high was it for wave ii. That would be super-bearish, and would indicate extreme weakness. 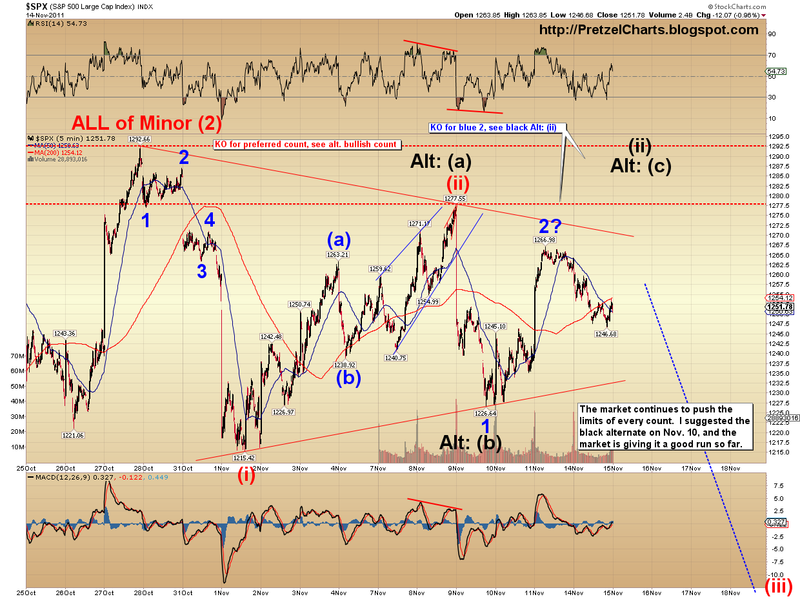 There are other possibilities as well, such as an a-b-c flat that doesn't get up nearly into the retracement range. I wanted to post something as a "safe" setup in stocks, and that was the best I could find. No guarantees the setup even gets there though. Retracement levels in a weak market usually fall short. But a retracement that made it up that far would be a fairly "safe" setup, with limited drawdown to the KO. That was my main reasoning behind posting it. Doji actions precedes big moves? 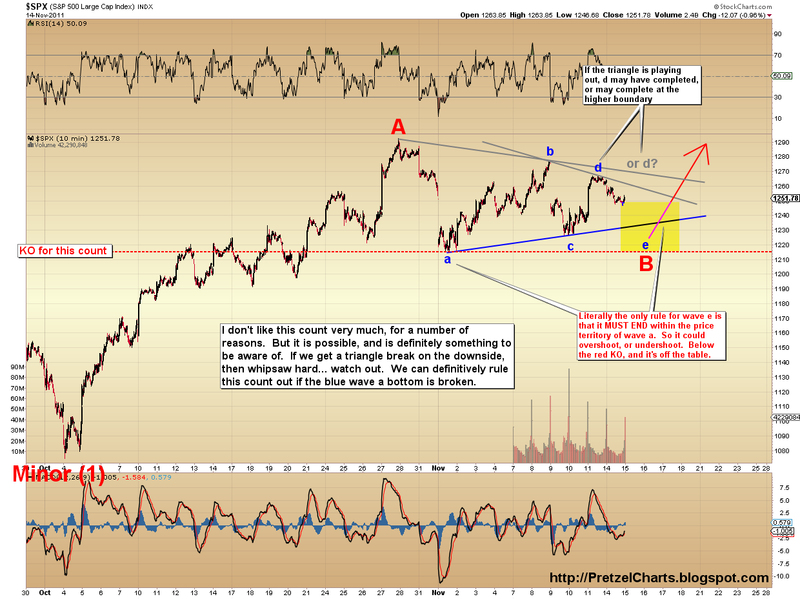 Gotta add this again, if the dollar is setting up what I think here, that should scare the hell out of equities bulls. I'm really having trouble viewing it as anything other than 1-2, i-ii, with iii of 3 to come in Uncle Buck. It could always be something else, but right now, I can't for the life of me imagine what. It would have to be something really off the wall, pattern wise, to be anything other than dollar bullish. the correlation of the dollar and the spx is only a recent phenomenon though (recent years) so maybe this is the time that that correlation starts to break down? just a thought. Could be a bull dollar and a bull market? It may provide perspective on Pretzels comments today. I would think if that's coming, it's down the road a ways. agreed, I think the correlation continues...just throwing out ideas. Seems like the Fed works for the markets. Bubble the Bubble. Go Fed! "14/11/2011 - Composite leading indicators (CLIs) for September 2011, designed to anticipate turning points in economic activity relative to trend, continue pointing to a slowdown in economic activity in most OECD countries and major non-member economies." I like to track currencies/commodities because sometimes they have much cleaner structure, since they don't fall prey to some of the same games as equities. Keep meaning to do a EUR/USD chart. That chart has some of the cleanest waves I've seen in a long time. I think it was Rock or Frank who, a few weeks back, asked me to look at that chart. I went and looked at it and came back 5 minutes later with a ST prediction that panned out perfectly. Any chart you can count in a few minutes is a super-clean chart. I sometimes spend an hour or more on one index chart, going back and forth between 1-minute, 5-minute, 15-minute, 30-minute, etc.. Other times I'll literally just stare at the chart for a long time, running different mental counts over and over, carrying my laptop from room to room. Don't seem to run into that *near* as much with currencies in particular. while being en route to JFK, I really like your "cash is an option too" paragraph. It is something we all need to be reminded of once in a while and not having to be ashamed off. I've been cash since Oct 31. Can't make pancakes of this market. And you know what; it feels actually really good to look at things from the side line for a while. Brings some perspective. Pretz, for those who think this post wasn't as great; not your fault. The market is just not giving any signals to going N or S or E or W... I don't think EWT can do much with that either, which is pretty much what you are showing. One question : why does the e-wave have to be between ~1251 and ~1215? Yeah, Fed definitely in the biz of supporting equities since they decided to take the job on in the mid-90's. Arnie, wave e must end within the price territory of wave a. That's the only rule for an "e" wave. So if it exceeds the wave a bottom @ 1215, it must be something else. As to 1251, the mid-point of the triangle is where wave "e" *usually* starts thinking about ending. That's more of a guideline than a rule. If the bear case prevails, this lost decade is one big head and shoulders formation on the SPX huh? 1245 resistance holding for now. PL, you got a KO-down point for your 60%chance bkx count above? It's at 38.25 right now, just took out last wed. low. For I will track all day until it KO's it down, because if it does not break it down today, the bear case is dead for next 2 days. IMO, nothing will go down without the kbx leading the way, in this bigbank-fraud market. pretz, thanks for explaining. good stuff. thus it might be that wave d hasn't completed yet, if 1251 is "voilated"? The BKX is acting decidedly bearish. If that was it for wave ii, it means extreme weakness. There are, of course, other possibilities, such as that wave ii isn't wave ii, but is in fact a fourth wave. Either way, the retracement targets have been nullified for today. FWIW, I took the big 'tell' of the actual confidence level of bulls to be the trading on Friday. Bulls could have run the SPX up to 1,275 and beyond with no real resistance last Friday. Volume was light. The conditions were perfect for a run up. I think there is a reason they did not go much beyond 1,265 though: the pros don't believe they can actually hold the market above that level for any length of time. And so it simply would have been too expensive to run it up there. The pros on the street can look ahead to the Supercommittee talks breaking down; bond spreads in Europe rising; a possible impending rally in the dollar; the two previous failures to hold the 200 dma. Friday was a perfect fakeout day. And to sell off excess inventory and initiate new put and short positions, which apparently happened in droves in SPDR financial ETF (whose ticker symbol escapes me at the moment). Today is opex week, so the sideways movement is not a surprise either. It *seems* awfully likely that the 'max pain' level for puts and calls expiring worthless would be the trading ranges we've seen most the last few weeks: Between 1,245 and 1,255. It doesn't seem like sellers have a lot of firepower they are throwing at the market lately either. But I would think the pros see the writing on the wall for improving selling circumstances coming in the very near future. The Supercommittee will be in the headlines soon enough. They may just punt the issue without fanfare to some future date, but the POLITICAL calculation (of both sides) will be to see a market meltdown that can be blamed upon the opposing party. Which can only happens if equities decline in a meaningful way. Also: the increasing bond yields spread for Italy and Spain. That is not going to get any better. Where are the buyers going to come from to push those yields back down. That story probably stays in the headlines for awhile, pushing down financial equities and (probably) rallying the dollar. Meanwhile, if CTP and Pretz are right that China is on the verge of major declines, that could be the back breaker. Not saying that the bear case will all unfold as outlined above, but I am more speaking to what I suspect the trading pros who move markets and are neither bears nor bulls except as the circumstances dictate are likely to be looking at: a lot of downside possibility, any one of which would lead to a big leg down in the very near future. For that reason, I just don't think that the Street pros have a lot of confidence past 1,260. You'd be buying into the possibility of some very strong headwinds passing through on the next news cycle. Good, bkx 2-day bullcount out. And you said earlier that what that meant, was that the immediate shortterm (today) for bigbanks was strongly bearish (and therefore, the rest of all markets should shortly follow, today also)? In other words, have the odds increased for today being the crash day, ever since the market leader bkx 2-day bullcase was taken out, right now? "Poll: American Dream Lost for Many"
So, if the market crashed today, it would be perfect synchronicity. I love me some synchronocity!...wait what? So, I guess that 1245 support held pretty well. For now. As to whether "today is the day" -- I honestly couldn't really make that call w/ any confidence right here. SPX pattern still has too many potentials. RE: BKX, it looks like the wave labeled as "wave ii" was probably the 4th wave of wave i. NOW we might get a decent retracement there. Alright, guys. 3 hours of sleep last night is killing me here. Gotta get some rest, I'll be back on later. Ok, I am back to keeping track of the bkx. So, what would you call a "decent retracement" that fulfills the 5th wave; and, in the other direction, what would you call the KO down count of that potential retracement, and a continuation of an immediate bearish count? like I said, ever since you brought it up in today's article, I consider this bkx chart the leading tell for today, because the spx (and PM's) will follow whatever it does, for next 2 days. This market shouldn't be rallying right now. WTF? Does any one have any news? I see no reason for this rally. Probably TPTB coming in and jacking up prices to spark a short covering rally. Equity mkts have diverged from credit mkts. CDS moves today suggest both France and Austria face imminent downgrades of their AAA status, meaning EFSF doomed as a "solution" to anyone still harboring illusions. Do you trust credit or equity to be calling this right? ...rhetorical question. Yeah I guess. Markets didn't seem to move when Evans was talking on CNBC arguing for more easing, but then took off right after that. I am getting quite nervous that something large and bullish is coming soon because this market is way too elevated here. Somebody knows something. Probably all the Congress members buying stocks before they come out with a grand bargain bazooka out of the Super Committee. Article on BB shows how stressed the credit markets and interbank lending markets are. Same thing happened in '08, equities got the picture late then too. "The spread between the dollar London interbank offered rate and the overnight index swap rate projected by contracts trading in the forward market rose to 62 basis points, the most since May 2010, according to UBS AG data. The FRA/OIS spread for the March to June 2012 period projects a widening of more than 24 basis points from the current spot dollar Libor-OIS spread, an indirect measure of the availability of funds in the money market and of banks’ willingness to lend. Banks borrowed the most from the ECB since June 2009 in a seven-day refinancing operation today. The central bank allotted 230.3 billion euros to 161 bidders, up from 194.8 billion euros and 150 bidders last week. Looks like the market wants to squeeze out the last bears. Buckle up fellow bears. Cash seems the smart place to be at the moment. This may be a stops clearing breakout. And positioning for op ex. The up move is curious though. The credit markets and European bond spreads do not appear to support this upward move over the Intermediate term. Though ST seems impossible to guess. The failed test of 1,245 must have given confidence to buyers for the afternoon session. What confuses me is how we rally so hard when the Euro rallies and the dollar falls (e.g. Friday's Euro squeeze), yet on a day when the Euro is weak and dollar strong we still rally. Today's rally is really confusing. It makes me think we're going to gap up like 2% tomorrow. Seems like there is hope of ECB rate cuts, FED stimulus and 'the press'. Markets are hoping that ECB will do something to kick the can further down the road. This does not change the bearish scenario IMO. Everything is banking on 'robust' US recovery. I am thinking 1287 is the max upside stop on SPX based on Fib and Gann confluence zones, if the bear case were to hold, so we'll see. I am mostly in cash except just having a small short position in AAPL, which I will bail out if it hits 390.50 (just above fib confluence zones). Hm... if Italy defaults and leaves the Eurozone. It will restructure its debts and devalue its original currency correct? What would happen to the cost of a Ferrari (I think that's an Italian car correct?) Will it get cheaper :-) ? Thanks for the insight, Frank. Seems like a 'good news' afternoon today, which pushed the indexes higher. A positive retail report plus possible shortages pushed oil higher. Not good for those who'd like to see sellers push lower. It is curious though that market direction is overlooking the Italy and Spain bond yields issue. Which is a much larger issue than Greece. Another capture of the 200 dma, especially if it holds for longer than a couple days, could certainly spark more irrational buying optimism from here. The recent halt of the SPX at 1,265 I think was fueled by lack of certainty that higher levels could be held. Will be curious to see if bears will try to hold the line anywhere or just let the bulls run back up to the 200 dma. 1264 and $AAPL at 388.87 with a gain of $9.66 right now for the day. I suspect that very recent developments in EZ sovereign bond markets mean that either crisis engulfs us, or the ECB commences some form of monetisation. There is a near consensus now for the ECB to print imminently. I *really* don't like consensus calls, but I suspect the contagion now being seen across EZ bond markets makes it more likely than not that Germany "blinks" and sanctions some form of overt ECB monetisation. I guess we'll see over the coming days ahead. They will never let this bubble burst. The market took a couple days to react the first time Italian bond yields jumped. Arnie says: S&P lost half of its daily gain in the last 30min. And didnt break through 1245 either. Looks like the bears are already hibernating and the bulls chasing a red blanky in an arena!? How long can this choppy trading last? No-one wants to hold a position over night !! I will say that when it comes to sniffing out money printing that the precious metals market tends to be the best detective so play attention to that tight triangle on silver as a leading indicator for the SPX triangle. German nationalism will not allow ECB printing. Europe was relentless in forcing them to pay war reparations in the 1920s which forced them into the worst cycle of currency inflation ever for a major economic country. Germany will ultimately abandon this charade and return to the DM. The rest of Europe needs to learn what responsible economics is, they don't get it...and if we're not careful, the US is heading down the same path. I dunno, Germany mercantilism is benefiting hugely from the weak Euro. If the went back to the DMark the Dmark would soar to the moon from safe haven flows and their industrial base would be decimated as described in the article I just posted. The one's really getting screwed are the PIIGS and the question is how long they can be cowed into submission by the doomsday fears of what would happen to them if they left the Euro. It's just one giant game of chicken. And the question is who blinks first. I don't see how either outcome is positive (crushing austerity and resulting EZ recession) versus default and financial turmoil. But evidently the market has no worries because they are convinced the ECB will never let anything bad happen... go figure. yes, very interesting article, I read the nested article too on why germany needs the euro. All valid economic points, but as you've stated, politically I can't see the periphery or the core buying into the idea of continued austerity & monetization. Like I said yesterday, and this is my biggest fear right now, if they do turn on the money faucet this market will go through the roof IMO. The whole crash will be delayed by several more years. 1) ECB goes Helicopter Ben style: This scenario would mean bull rally to above the May high for SPX. 2) ECB doesn't print and PIIGS continue to cowtow to Germany's austerity demands. No immediate crisis, but eventual train wreck as deflationary spiral will set in. Bulls maybe cobble together choppy Santa Rally and true stock market collapse probably postponed until early next year. 3) ECB doesn't print and PIIGS populace tell Germany to f&*k off as they have had enough austerity. Immediate financial collapse and stock market crash. I suspect that #2 is the most likely outcome for the time being, but at some point soon we will be faced with #3 unless ECB blinks and gives us #1.
i feel like moving to all cash. This market is troubling my bear conviction right now. What are you guys doing? I lightened up a little today, and for the rest my stop is in place. If they take me out then so be it. Can't win 'em all... I have to admit this is THE toughest market I have ever encountered in my 15 years of trading. - for the ECB to print in a manner that can be sold to Germany as "limited", but sufficient to cap yields for now. This is a less extreme binary outcome; one in which all parties can present a positive story to their respective electorates, but also one in which all nations bear some cost (whether that be overt fiscal cost in Germany's case, or loss of fiscal sovereignty in other countries' cases). RE: triangle fakeout -- read yesterday's acticle, and look at "Alt: (c)". I like the idea, hopefully the market agrees w/ me. RE: the rally. Look at the BKX chart and compare it w/ today. Might have been 17 cents early calling the bottom there, but it's pretty durn close. Today's action is not unexpected. I have to run into town, but I'll bbl. The Fed is out communicating that QE3 is coming and this is all the bulls can muster? If this is the 'buy the rumor' reaction, the bulls are in trouble. If there's strong follow-through in coming days, I'll cover. But I'll pay the extra rent now to be in early, rather than feeling like I'm chasing if we should open down 5% some morning. So, who is to be fooled? Who will prevail - bulls or bears? MAV; I've been all cash for the last 2 weeks (but I am a long-term trader not a day trader [anymore]). Pretz post today about cash being the 3rd option is a very good and valid point. I want some solid confirmation before entering again. All this sideway BS is no good no. Anyway, you guys want some bad news. Well, read this: http://www.reuters.com/article/2011/11/15/eurozone-idUSL5E7MF42T20111115 (Summary: France came under heavy fire on global markets on Tuesday, reflecting fears that the euro zone's second biggest economy is being sucked into a spiralling debt crisis.) Bad enough far y'all? Been a lurker for a while, but love your blog Pretz! Still out, chiming in via phone. IMO: there is bad news on the immediate horizon, and the Fed is trying to front run it. All this sudden talk of QE3 makes no sense in any other context. We just had the meeting fercryinoutloud. *Must* be something bad about to happen. Can't see any other reason for this. It is amazing that everybody is looking at the same data and coming out with different interpretations. And all of these have many years of experience in trading. I think this is what makes trading amazing. PL: the BKX chart is spot on. Wow! Can you explain again what you are looking for tomorrow? (1) is it a fake out below the triangle and a whipsaw up, or (2) ALT (C) in yesterdays post chart 3 that forms an expanding diagonal, or (3) does the SPX follow the BKX down? Thanks. Agreed Pretz. Fed knows something is up. QE was not on table just two weeks ago at the Fed meeting. 11 days ago policy was appropriate, but now we need more easing. Really??? WTF happened in just 11 days to cause a 180 degree shift in the outlook? The bond yields spread increase for Italy and Spain happened. And if the ECB had to buy it's own issues per the Guardian story you linked to Sunday also happened, then the Fed knows the game is up for one simple and inescapable reason: Outside of Germany, EZ debt has NO buyers left. And they still need a trillion or so euros worth of buying to still show up. Which isn't going to happen. The well is about to run dry. You think 7% yields are high? Hmmmm, 7% is BEFORE the real crisis reporting and sheer panic has arrived. My guess is the Fed sees the writing on the wall. Shangai Composite at 2507 & going lower! futures are way down. Now me unloading my shorts seems like a bad play. Its okay though, next time I'll know that this gut fear feeling is probably a good time to go short. Notice how the entire commodity and currency complex (ie. risk assets) respond to SSEC. China growth story (soft landing hope) is THE crux of the entire bull thesis. With Eurozone, US, and Japan stagnant, if China growth falters then what is left? You still have some shorts one right? I thought you only covered 1/2. Bulls certainly put some fear into shorts today yours truly included but I kept 1/2 of my short position because I had to give 11/14 +/- 1 cycle high the benefit of the doubt until proven wrong. The futures tonight are encouraging but it is still early and anything can happen between now and tomorrow's open. If bears are gonna make this happen they need to go for the jugular tomorrow with a big down day. The set-up is there the bears just need to show that they gave some cojones. above "gave" should be "have" LOL! Although if we get a big up tomorrow instead maybe the will be giving them up. Come on let's have a good old fashioned risk-off liquidation day tomorrow... I am just so ready to bust out the "It's On Like Donkey Kong" ;-P but just need the market too give the signal. China's (FXI, PGJ) fiscal policies foster high savings and a high risk of capital misallocation and asset bubbles, IMF warns in its China stability report. China's largest banks face systemic risk under the IMF's most severe scenario - a point Beijing took little time to dispute. Hey guys, been busy with some other stuff but keeping track of my indicators. Italian yields blowing out? Check. Spanish yields blowing out? Check. French yields blowing out? Check. EFSF yields blowing out? Check. US corporate credit market showing signs of strss? Check. Euro making it's way to the cliff for wave 3? Check. US dollar ready to unleash itself to 80+? check. US equity markets completely oblivious? Check. Pretzel- you asked what changed in the last 11 days which made the Fed stooges come out of thier boxes to tell us they are ready to go QE3? Well, i think the answer is that they have been given the headsup that the ECB is actuLly contemplating monetizing some of the Italian and Spanish debt. This is why the US dollar is moving higher AND equities are moving higher. BUT Bernanke doesn't want to see his export led recovery flounder with the US dollar strengthing so he has to send his perps out to try and talk down the dollar in the face of the expected Euro weakness. So...what does this all mean? Well, ultimately i think that this scenario is the was out of the mess....however, Germany is not ready to allow this yet and they haven't been able to force austerity on the Italians yet. So, Germany will come out and pit a kibosh on this scenario sometime in the next few days or week and markets will fall..BUT ... Germany only wants short term pain so they can institute their fiscal authority across Europe. 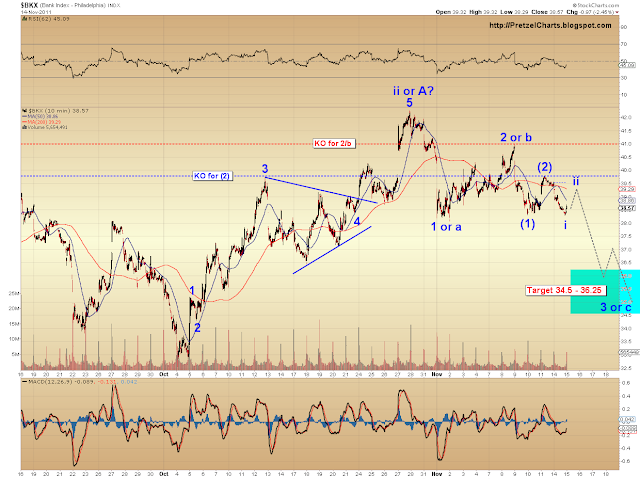 I am still bearish but i can see a path to a very strong C wave. If we take out Tuesday's low tomorrow that is a breakdown that I would consider shorting with a stop at Tuesday's high. I know that's a wide stop so I personally would use a smaller position size for such a trade. Euro broke 135 (currently at 134.53). Futures are heading south. Additionally, a number of Spanish and French bond auctions on Thursday. The both closed at record spreads recently. I think dollar is topping out today. Its fall from tomorrow might trigger next leg of SPX rally up??? Just contrarian view. OK, one last comment before I turn it in for the night. Yes tomorrow is going to be a BIG move one way or the other IMO. I'm betting on down due to what my cycle work says, but if we get some surprise QE announcement from ECB tomorrow then bulls win and I'll have to take my lumps. That's what makes a market and that's what stops are for. Wow, This is all the kind of conversation that usually goes on just before a wildly dramatic move. Personally I am short a little bit. I agree with Pretz - past month shows, no change in news here but suddenly 'we need QE3'? - European leaders jumping ship - charts look puke green - anxiety among the little guys short and long - I wonder what is known behind closed doors? I am not sure that even a QE3 will get a rally if the markets smell a hidden rat. And if the rat comes out I don't think that QE "whatevers" are going to fix it. But we shall see. Are we having fun yet? Okay, back finally. Busy day! Dollar continuing higher, and as I posted several times throughout the day today, continues to look like it might be on the verge of a major lift-off. Main question I have is whether we see a little consolidation first, or just keep running up. Today might have been a big gift to oil bears. I'm still riding my shorts taken Friday at 99.24 (lol, you can even see that price in the screenshot I posted in Friday's article... I took my position, then rushed to let everyone know what I saw). IF I've got the oil counts right, as posted on Friday, there's absolutely huge potential in that trade. Even if I've got them *half-way* right, still huge potential there, lol. Haven't really had much chance to study everything else yet, but the BKX living up to my count (after the 17 cent "tweak") is an encouraging sign for equities bears. Hope somebody took advantage of that setup -- I really posted it in an effort to point out a simple trade for folks to follow. What would be really helpful to the bear case here is for ES (spx futures) to make a slightly lower low, then bounce roughly back to its current level (1243ish), then make ANOTHER new low. That would confirm an impulsive structure -- and it's well on its way right now. If it forms that structure, I would expect it to take out yesterday's low in the process. From there, we could see a bounce -- watch for a 40-60% retrace on the bounce -- which might be a good opportunity for bears. At the minimum, that would be a great short-term setup, as the five wave structure would all but guarantee new lows after the bounce. I'll try to post a chart in a bit. pretz I really enjoy your simple trades! please continue them ;) For educational purposes of course. Okay, here's the chart and setup. This is for *educational purposes only*. The setup is contingent on ES completing the "proper structure" as oulined on the chart. If the structure isn't approximately as shown, it voids the setup. It is also possible that ES will "run away" from this trade and do something completely different than the chart suggests -- for example, it may not bounce. That's okay, there are plenty more setups every day. This is for purposes of illustrating a SHORT TERM day trade, which could potentially yeild about 20 ES points. Covering inside the target zone is the "safe" trade, and a conservative trader might not push his luck in that area. If one wanted to pursue more profit, possibly by using a trailing stop to lock in some level of profits, that would be another option. So far, I find everything I'm seeing as extremely encouraging to the bear case. Let's see if they can keep it up through morning, and maybe get this thing rolling over for real. I think many folks here are only a little short or in cash altogether. A gap down may not be what they want to see. But then again, that's why a gap down is highly likely. It always happen when you least expect it. Yep, not a market for the faint of heart, that's fer sure. Regarding the educational trade setup I posted, if ES can peek below 1234, the setup will be complete, and looking to short the bounce near the 40-60% retracement level with managable stops would be a solid play. btw, POTUS, appreciate it! and I'm glad you've found a way to "retire comfortably." There's nothing worse than retiring UNcomfortably -- just ask all those former European Prime Ministers. Remember that futures entail risk of loss and all that, talk to your broker! Personally, I think trading the cash market is a HUGE handicap, especially in a bear market. So many big moves happened overnight in '08. I would have long-ago torn out all my hair and eaten it with mustard if I were stuck trading the cash market. TJN I can't trade futures with scottrade either so I feel your pain. Also, I don't know enough about trading futures to feel comfortable doing it. Is is the same as trading in the cash market but you're able to do it 24/7? We actually never got the exact setup I was looking for, so I can't be certain that was an impulse wave. We got one lower low, but not two. I'm trying to integrate Disqus with the blog, because it allows for "replies" to comments and so on, but it's trying to make me kill myself it's being so difficult. That's a yes, Pretz. LOL. Had to switch to Google Chrome to install it, IE wouldn't let it happen. Now I just have to figure out how to get the colors right so I can see the "reply" button, since I would have actually replied to DanC if I could, lol. I'll have to come back to it, running out of time to get my work done. Stupid Disqus. Should have known it would be a problem -- from a company that doesn't even know how to spell "discuss." I guess it's not for real discussions... it's like "Cheez" which is the name companies use for products that don't contain any actual cheese. "Froot" is another thing I'm always leary of. I think you can actually do image attachments now, with the +image thing. Imma test it. Oh wait, that's like everyone's default avatar. Fail, Dan, FAIL. lol -- it beats the stupid little "shadow guy" avatar, don't you think? You can still customize your own, but that's the default for anyone who doesn't have one. I just chose that 'cause it was the first picture I came across. I'll mess with it later, if I ever finish my work, which I won't. This is like a new toy! The educational setup posted earlier seems to have blown past the "short zone" and is looking less corrective in nature to my untrained eye. Seems to have bounced off the triangle for now. It did exceed the zone, but not the stop. E-minis crashing right now, wow. The educational setup posted earlier is now in the black. ;) Tightening stops. Crude had a failed test of top and has posted a nice engulfing/reversal bar on the 1H chart. One of the things I think would be really useful for your blog would be some charts that "show the math" behind your cycles work. Personally, I find it hard to use statements like "the market should make a high in the next three days" as anything helpful to a trading decision -- since I don't know what that's based on, or *why* it would or wouldn't make sense. But seeing the math and charts behind your reasoning would really allow a person to decide if the call was useful and why, you know? Also, most blogs don't allow *any* links which redirect traffic to someone else's blog -- it really takes away from the community. I've allowed you a free leg-up through my blog, and I feel I've been quite generous in that regard. So now all my readers know you're out there and they're free to check out your site whenever they want to. :) I'm sure if you commit to the same 60-80 hours a week that I do, yours will grow just as fast as mine has. So from now on, if you'd like to share a chart, please do so with the image attachment. Wow, what a crash. The "educational trade" worked out quite well. It's educational, alright, 'cause this market just got SCHOOLED. lmao. Covered at the potential double-bottom for 14 points, because we'll get some type of obligatory bounce there. Will reassess. TY Dan, I think they're there, but not showing due to the default color scheme. Pretty sure I can fix it when I have more time to mess w/ it. 90% certain that bottom won't hold. We should go lower here. Stress levels in Eurozone sovereign debt markets (French/German 10yr spreads closing on on 2%) mean some form of imminent policy response is likely. I'm watching in the background. Good job on nailing those educational spx 14 trading points, in and out, and then calling for a rebound. I think today's the day, panic appears to be building, regarding those large spanish and italian bond interest rates purchased by the ecb today, and what they foretell. I still like silver as best % fall from here, from $34 to $26, and in matter of days. And I also see below that CTP has now joined me, in betting against silver. If you have time to give a glance at the silver chart, I'd like to know if even a quick impression, also tells you what it's told me. Btw, the cartoon pic I posted below, was intended to be my avatar, and not a posted graph. I do not know how to change the avatar. If the pic bothers you, just erase my post. Anon20- ty. NP w/ the pic. Not sure how to work this thing myself yet, lol. I'll try to look at silver later -- now approaching crunch time and trying to get my work done. ES and Crude diverged currently - the lower than forecast CPI print causing Crude uppage? PL, looks like you pissed off CTP, and now he says he is gone. I will miss his input, solid veteran trader stuff, you complement each other, IMO. CTP, you will make loads of $, IMO, if you ride silver all the way down to at least $27, a slam dunk, once spx slide truly starts this week (NOT trading advise, this is a PRIVATE opinion). And I wanted to tell you, PL, that you have your disqus pre-determined primary setting at 'most popular', instead of 'sort by newest first', which, IMO, is where you should have it preset at, so the continuity of your latest blogging posts, is not interrupted. Also, is there a way to refresh the comments, without having to refresh the entire blog. PL, continue focusing tight on the spx beat by beat, that's your expertise, because I don't need your silver market confirmation at all. I am already confident, and placed all my bets against it, over a week ago. However, your important chart from yesterday, the bkx bank index, an current update on that, is important, as I continue to strongly opine, that the American bigbanks will continue to lead all markets down, and they are the biggest American tell, as to market direction. btw, I told you I had a good prechter free chart, of 1930-32 dji, showing exactly how violent bear-market rallies work. I enclose it. Would like to know your opinion on it. Whoa am I seeing things are did oil break 100? CTP hope you and Pretzel can work it out. Your contributions have been appreciated; would hate to loose you. Wow, oil just blew up. Further, I wasn't trying to demean your cycles in any way, I was merely trying to convey that, for me anyway, I have to see the math behind something to give it any weight. I can't follow something blindly, although maybe some can. I'd love for you to hang around -- however, if you feel that me politely asking you not to aggressively attempt to redirect traffic is somehow unreasonable, I understand. Also, just so you know what made me feel like things might be getting a bit out of hand... here's a couple examples which sounded something of a sour note. They both struck me as somewhat condescending, and as more than "just trying to help."